Terraces and cigarettes. Rosé and the summertime. Radishes and butter. 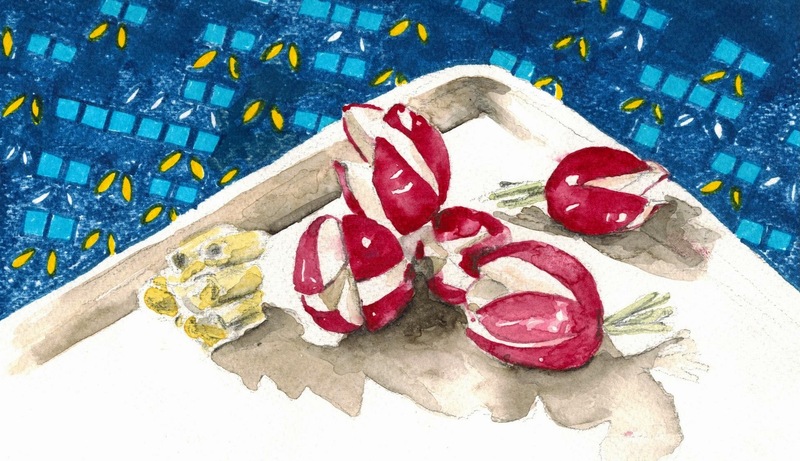 Radishes and butter? Yes! As a Ranch-dipping American, this came as a bit of a surprise to me . (How does one butter a radish? Have the French found an excuse to dip things into butter now? I admit to sneaking single-serving Country Crock packets under restaurant tables as a kid, but this is absurd!) In France, butter is the assigned spouse to radishes, with a sprinkle of extramarital sea salt just to keep things interesting. Although everyone does it differently, according to mon mari qui fume, the butter to my radish, the radishes are cut into four parts which create the surface area for the butter. The beauty of the pairing instantly makes itself clear; the smooth butter flatters the crisp, occasionally spicy radish. Give it a try! Anyone know where to get some Country Crock around here?